Tongyeong can transform into Korean equivalent of Sweden’s Malmö. April. 16, 2018 07:40. .
Up until 10 years ago, Tongyeong in South Gyeongsang Province was home to five of the world’s 100 largest dockyards. 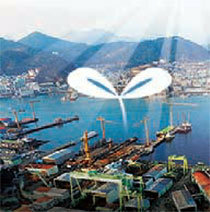 The city was widely famous as hub of medium to larger shipbuilders along with giant shipbuilding firms in neighboring Geoje. Due to a slump in the shipbuilding industry, however, five shipbuilders namely 21st Century Shipbuilding, SPP Shipbuilding, Shina SB Yard, and Samho went out of business. Recently Sungdong Shipbuilding & Marine Engineering was also put under court receivership, which collectively caused one of Tongyeong’s economic pillars to collapse. The government has opened an international competitive bid to collect master plans for revitalizing the city to restore Shina SB Yard’s worksite in Tongyeong, once dubbed “Asia’s Napoli,” into a regional landmark. Malmö in Sweden is the model the Korean port city is seeking to benchmark. Malmö transformed from a shipbuilding-centered industrial town into a knowledge and residential city from the 1990s. The Swedish city’s government supported the development of the IT industry and constructed a bridge linking with Copenhagen in Denmark in 2000 to expand its economic boundary. The removal of giant cranes from the city, an incident known to Koreans as “Tears of Malmö,” was not the sign of the city’s demise, but a process for its revival. Thyssen steel works in Duisburg in Germany, whose operation was suspended in 1995, has been reborn as a city filled with a concert hall, youth hostel, underwater scuba diving and leisure facilities, and rock climbing facilities. Distillery District in Toronto, Canada has transformed from an area of deserted distillers into a tourist hotspot packed with cafes and restaurants. Classical environment exuded by red clay bricks in the city offers picturesque sight and mood. “F1963” in Busan’s Mangmi-dong was a site where Kiswire would produce steel wire from 1963 to 2008. The site has now become a general cultural space where numerous steel beams collectively function to reinstate the imagery of a deserted industrial plant. Cities that have undergone successful remodeling projects have one thing in common: they made most of their unique characteristics and strengths based on a long-term perspective. In this regard, Tongyeong surely is a city that is well positioned. The city has the tradition of countless artists and musicians thriving in their own hometown, time-honored handcraft techniques that have been inherited for generations, and blessed natural environment. If a new landmark that will be constructed through the national project to revive the Tongyeong dockyard will create nicely harmonizes with such strengths the city has to offer, it would be quite possible to reinstate “Smiles of Tongyeong” anew.